This episode takes us into the Highlands, and gives us our first real look at life outside the castle. Before I say anything else, just let the beauty of the scenery wash over you. I was lucky enough to get to visit the Highlands two years ago and it is majestic. Outlander's wide angles and sweeping cameras do an amazing job of capturing its wild and untamed glory. 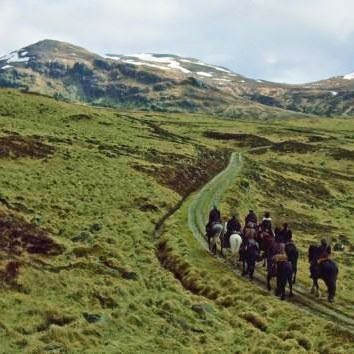 Love for their land flows through the veins of these men – the Highlands are not just the location where this story happens, but a part of who these people are. There is a great deal of conflict between Claire and the MacKenzie’s in this episode, but much of it seems to be only due to their distrust of her, and her misunderstanding of their actions and motives. Claire is very judgmental of their behaviour, and frequently assumes the worst of Dougal and his men. She accuses them of being corrupt thieves, stealing from both their tenants and from his brother, not to mention accusing him of allowing a child to starve. Then The Watch is introduced, Scots who essentially patrol the Highlands looking for bounties, and they just seem to confirm her opinion that they are all barbarians. But as Jamie tells her, she shouldn’t judge things she doesn’t understand. Since she doesn’t speak Gaelic, and since the men are specifically tying to exclude her from what they are doing, it takes her a while to understand that Dougal is not embezzling money from the clan for himself (not exactly), but in order to help fund the return of their preferred king, James III. What is not clear at this point is what the Laird, Colum, thinks of this, and whether Dougal is acting on his own. What is even stranger to me is this: if Dougal believes her to be an English spy, why allow Claire to witness these treasonous activities? Yes, he knows that she doesn’t speak Gaelic, but he also knows that she isn’t stupid. Is it a test, to see how she would react? Why did he bring her along in the first place? James II (or James Stuart) was the Catholic king of England and Scotland, but with the Glorious Revolution in 1688, he was deposed and replaced by a Protestant king, his son in law George II. He died in exile in 1701, and his son became known as James III, the Old Pretender (if you were English), and the King Over the Water (if you were Scottish). James III made at least three attempts to regain his throne, all of which failed. So, in 1745, his son Charles Stuart, known as the Young Pretender at the time and now colloquially as Bonnie Prince Charlie, decided to make another attempt to recover the thrones of Scotland and England (and Ireland, I think) for his father. Charles raised some money, mostly from France and the Vatican, and called his supporters (called Jacobites, after his father) to fight with him to reclaim Scotland. They did very well at first, and pushed the British out of Scotland, but an ill-conceived attempt to march on London was their undoing and the Uprising resulted in a complete defeat on Culloden Moor on April 16, 1746. Over the next few years, the British raped and pillaged, literally, across the countryside, leaving famine and suffering in their wake. The Stuarts died in exile and never rose again. - Dougal uses and humiliates Jamie over and over again in order to illicit sympathy from his audiences and stoke the fires of hatred for the English, but why does Jamie allow him to do it? He is more than capable of defending himself, so what’s his angle? - One of my favourite aspects of Diana Gabaldon’s writing is her attention to detail and thorough research. There are whole chapters dedicated to such seemingly mundane things as describing how to make blood sausage, or how one washes laundry in the 18th century, and I was worried that this would be an element lost in translation to television. So, the scene with the women waulking wool with hot piss made me deliriously happy! - Doesn’t it seem crazy to give written receipts to people who likely can’t read? - Don’t you just hate cliff-hangers?? This might have been my favourite episode so far – beautifully shot, wonderful music, and great performances all around! I can’t wait for next week’s Episode Six: The Garrison Commander! Read our recap of the previous episode: Outlander Episode Four: The Gathering of Clan MacKenzie. Christina Ivanowich watches television (and occasionally writes about it) from London, Ontario. You can follow her on Twitter: @civanowich.